Waterford born and bred, Laura works in UHW as the Laboratory Administration Manager and has been painting for 15 years. She has been involved in many diverse art projects including the Incognito Project at the Solomon Gallery in Dublin and the Art With A Heart for Syria campaign. Recently she returned to formal study at the National College of Art & Design (NCAD) in Dublin where she has just completed her first year in Visual Art Practice. 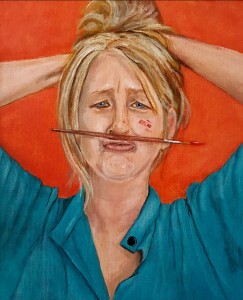 Her passion lies in portraiture and figurative work and her favourite medium is acrylic. Patience continues until 21 September.